I used McCall’s 7789 to make this jumpsuit. I decided on the tie-front bodice which I thought looked very cute and I added the straps for more support. My local shop only had the 14-22 size left, but I didn’t want to wait to have it shipped so I bought it and graded it down. I figured this wouldn’t be the only modification, as I pictured that tie-front bodice to potentially require a bit of fitting. Rightly so, after making a muslin of the bust, I had to alter the cup and reduced the size of the keyhole for a bit more coverage. I absolutely love those pleated pants. In that cotton lawn, they feel like a breeze. AND they have pockets! I’d like to make a standalone pair of these pants at some point; I think the high waist would look great with suspenders! This jumpsuit is pretty colourful for me, but summertime is for colour, no? 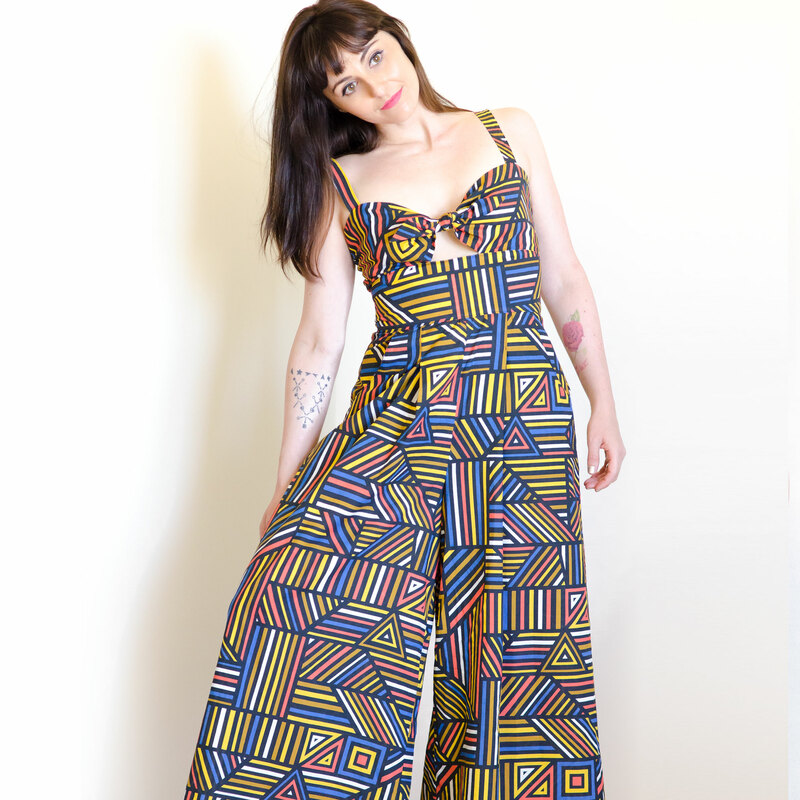 The fabric’s geometric pattern is eye-catching and I think it suits the jumpsuit’s silhouette well. It’s bold and fun, which means I can keep the styling and accessories to a minimum. Love this jumpsuit. I have never tried one…. Fabric shopping during vacay is the best! I love getting fabrics abroad and then not only being able to say “I made it myself” but also “I bought the fabric in France”, lol. I know!! It makes the garment extra special 🙂 I just wish I bought more of it! I think I’ve seen that fabric on the Sherwood fabrics website – it looks great as a jump suit..
Ahh that’s completely terrific! It looks really sharply made, too!